Gardening isn’t about competing with the neighbours, rather it’s about creating a space that makes you happy. Whether its a single container of petunias, a personal veggie plot or a large ornamental garden, take pride in what you create and be sure to enjoy the process. 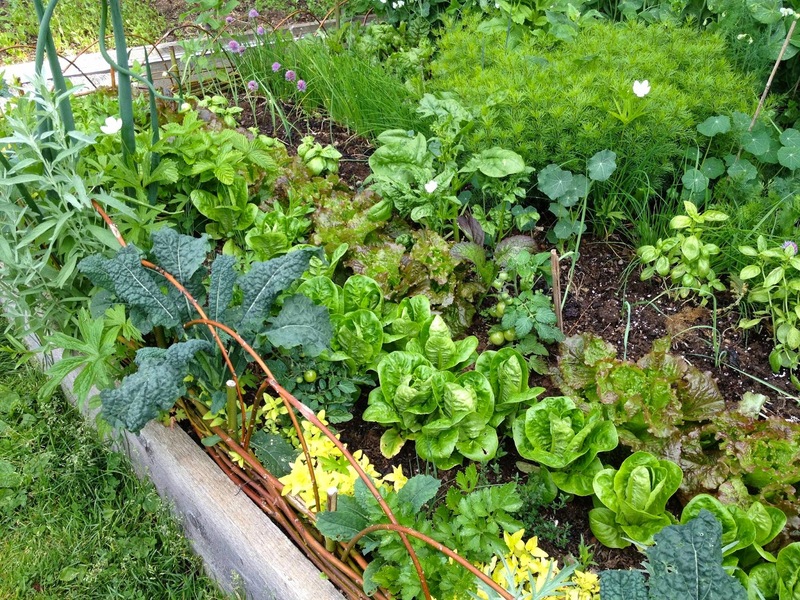 It’s very easy to go overboard when making your first ornamental or vegetable garden, but remember to start small. If you find yourself running behind and don’t have time to care for your garden, it will become overgrown and weedy and feel like a chore. Your garden should help you relax, not be another item on a ‘to-do’ list. Ok, this sounds cheesy, but it’s true. A healthy, low-maintenance garden begins with good soil. Yearly applications of compost or aged manure will feed the diverse populations of microorganisms who live in the soil, who in turn will release nutrients back to your plants. Do yourself a favour and grow plants that do well in our region. They will require less fertilizer, water and be more resistant to insect and disease problems. Not sure what they are? Ask at your local nursery, spy on your neighbours garden (not to compare, but just to see what they are growing) or join a garden club. It’s hard to go wrong with hardy perennials like daylilies, veronica, purple coneflower, yarrow and ornamental grasses. Top shrubs include hydrangea, weigela, azaleas, rhododendrons and rugosa roses. As for trees, I count magnolias, paperbark maple, Japanese maple, serviceberry and Kousa dogwood among my top picks. It’s amazing how homegrown veggies and herbs taste so much better than store bought, so consider planting a small vegetable garden, adding herbs to a windowbox or even tucking some tomatoes or bush beans among your ornamental plants. If you have young children or grandchildren, it’s also a great way to introduce them to where their food comes from. Plus, they’ll have fun ‘helping’ tend and water the garden. My favourite veggies include ‘Sungold’ tomatoes, ‘Lemon’ cucumbers, pattypan zucchini, ‘Emerite’ pole beans and ‘Napoli’ carrots. What advice would you add?? The one piece of advice I would have is to make sure you have a water source that is close & ready to go - having to lug a hose around all the time, especially during hot, dry weather when you may have to water on a daily basis, can turn gardening from pleasure to chore really quickly! The first thing I did after building the beds was to hook up a 4-way valve to the outdoor faucet so that I could have a dedicated hose running to the veg patch. For a first time vegetable gardener I would highly recommend beans. They are so easy to grow. They germinate quickly, demand almost no care and produce a first time gardener with almost immediate gratification. If they are forgotten in the garden they can be harvested in the fall and used as a dry bean in the winter. I would add: "keep a record of what you plant, when you plant it, and if relevant when you harvest it." There is a lot to learn, and keeping records can help you remember things better and benefit from your experience in previous years. Great advice for beginners....and great reminders for everyone! My advice? Grab, read, and reference a good gardening book or two. (I've found yours invaluable.) Nothing like help from an expert to build your confidence, knowledge, and successes. Try something different every year - pick a unique plant variety to grow that works for your zone. Last year was my first vegetable garden, and I stuck to things that I *knew* would grow, no matter what, in order to ensure success, and turned my head away from anything remotely special or unique. This year, I have a handful of more unique items to me: rainbow carrots, purple star peppers and old german tomatoes. I still kept the staples that did well more me too, like the green beans. We freeze them for winter, and so I do want an ensured success - why mess with something that works? But I also added a few seeds of different beans to get some variety with the fresh eating. Thanks for your tips.Its really helpful. Learn to be patient. To know success in the garden you have to wait for it to show itself. When you feel like gardening has little left to offer, experiment with new ideas. This year I'm trying Cucamelons for the first time!